Francis and Brigid Clauson’s new self-build is arguably the most energy efficient house yet built in Ireland. Yet it almost failed to meet building regulations. 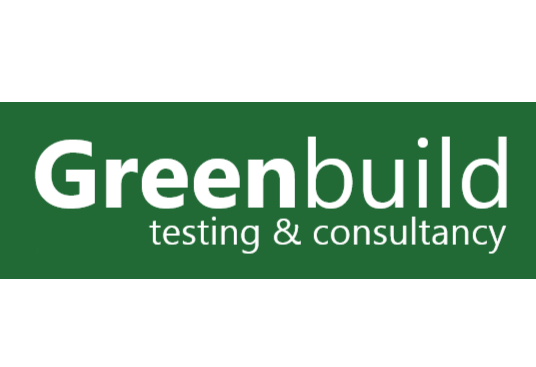 When working through the calculations for his Building Energy Rating (BER) Clauson discovered that though his plan would comfortably meet the highly onerous passive house targets, it would actually breach the renewable energy obligation under Part L of the building regulations. The problem stems from the changes to Part L of the Irish building regulations introduced in 2007, when renewable energy systems became mandatory for all new homes, along with unprecedented improvements in terms of both energy efficiency and carbon emissions. The regulation itself doesn’t go into detail. Instead it makes some general statements about energy efficiency, carbon emissions and renewable energy. It states that new homes must be designed and built “to limit the calculated primary energy consumption and related carbon dioxide emissions insofar as is reasonably practicable”. It then adds the requirements that a “reasonable proportion” of that energy demand must come from renewable sources. There’s a subtle but important point in this cumbersome language. The regulation says that energy demand and carbon emissions must be reduced to the greatest extent possible without going to unreasonable lengths, but it doesn’t go so far with renewables – it only requires that renewable energy makes up a reasonable fraction of the total energy demand. These general statements are fleshed out into clear targets in the technical guidance documents (TGDs). When the new Part L was published in 2007, TGD L was also updated. It defined the energy and carbon saving targets as 40% reductions in primary energy for space heating, hot water, cooling and lighting, rising to 60% reductions in changes to TGD L from December 2011. But both changes to TGD L set the renewables target at a fixed number – 10 kWh/m2/yr of thermal renewable energy, or 4 kWh/m2/yr of microgenerated electricity. This wasn’t a widespread problem for people building to scrape compliance with TGD L 2007, as for most building types the 40% energy reduction target still left a reasonable chunk of primary energy, meaning renewables still had a demand to help meet. For some smaller house types a fairly small solar thermal array could hit the 10 kWh/m2/yr target. Biomass boilers could typically comply, as could many heat pumps in spite of being penalized for various reasons outlined below. According to the Department of the Environment, meeting the targets set out in TGD L indicates “prima facie” evidence of compliance – a legal term which means that building to the levels set out in the TGD ensures compliance with the regulation. The department is on record as saying that the only way to actually guarantee compliance is to hit the targets stated in the TGD. 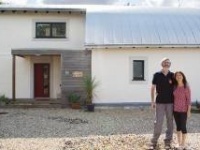 When pressed on this point by Passive House Plus editor Jeff Colley at the See the Light conference in Dublin in September last year, a department spokesman said that people who’ve built very low energy homes and therefore failed to meet the renewables target would need to take their cases to court if they’re to prove compliance. But both Deap and the new regulations give heat pumps a hard time. TGD L stipulates that only energy above a seasonal performance factor (SPF) of 2.5 can be counted towards the 10 kWh target to take account of the primary energy of grid electricity due to generation and transmission losses. According to Deap, every kilowatt used by the heat pump takes 2.42 kilowatts of energy use at the power station – 10% lower than the 2.7 kilowatts Deap listed till 2011. Energy from the heat pump to provide hot water can be counted towards the 10 kWh target, though this portion of the heat pump’s output is subject to a 25% penalty to take account of efficiency losses at higher temperatures. Clauson worked out in Deap that his heat pump would provide just 5.21 kWh/m2/yr towards the renewables obligation whereas his total energy demand is 42.64 kWh/m2/yr, so the proportion of energy provided by renewable technologies needed to be 23%. The big question is, does this 23% represent a ‘reasonable proportion’? What if Francis Clauson decides that it does but the building control officer decides that it doesn’t? Once he’d discovered this flaw, he went on to conduct a series of experiments on Deap. He reduced his thermal bridging values back to default figures, thereby seriously compromising the integrity of the building envelope. The exercise pushed the heat pump’s contribution to the energy needs of the house up to 9.3 kWh/m2/yr. Still not enough. Then he reduced the air tightness from the passive standard target of 0.6 air changes per hour to the default 7 m3/hr/m2, and this finally pushed his renewables contribution above the TGD L threshold, to 15 kWh/m2/yr. Though these changes moved the renewables contribution from 5.21Kwh/m2yr to 15 Kwh/m2/yr, they made the building less energy efficient. “This is barmy,” says Clauson. He engaged architect Zeno Winkens and Archie O’Donnell of Integrated Energy as energy consultant, and got a local contractor, Chris Gahan of GR8 Construction to do the work. Installing the windows did present particular problems. 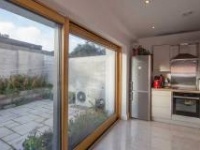 Alan Tier of Integrated Energy explains that their initial aim – for aesthetic and budgetary reasons – was to install non-thermally broken ‘lift and slide’ windows as opposed to passive certified, thermally broken ‘tilt and slide’ windows. 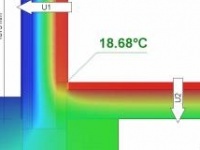 It is, he explains, theoretically possible to install non-passive standard windows and still achieve a passive standard performance, so long as no point of the internal screen is allowed to fall below 13 degrees. Tier modeled the windows exhaustively with this aim in mind, but in the end, he had to concede that due to the surface area of the building, it just wasn’t possible. Instead, a combination of both passive and non passive certified windows were installed. “Probably the biggest challenge was getting the airtightness membrane around the reveals and getting that to interface with the internal leaf of block work,” says Chris Gahan. 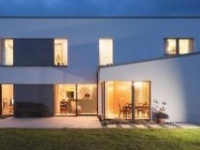 Aided by the day lighting benefits that tend to come with passive houses – an orientation and form which tracks the sun will also yield a natural light benefit – the house’s electrical lighting requirement balances energy saving with atmosphere. “The brief from the client was for the lighting design not to be dictated purely by energy efficiency," says lighting designer Rocky Wall of Wink Lighting, "but to create atmosphere and mood using energy efficient light sources." The design mixes CFLs, LEDs, IRCs and fluorescent bulbs to find the right tones of light for the house’s various spaces. The control system is simplicity itself: conventional switching and dimming. Coming up with a mechanical package for the house was another painstaking process during which various combinations of technologies were modeled and tested – from oil, gas and solar thermal through to the combination of heat pump and PV panels on which Clauson eventually settled. Speaking to Passive House Plus just two weeks after moving in, he says that so far, the house has performed exactly as modeled on paper. Building type: 359 sq m bungalow built to take in the panoramic views stretching to over 30 miles and to maximise the solar gain.